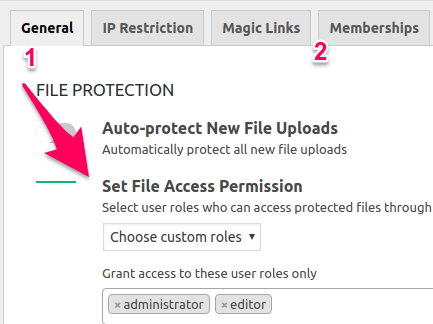 File access permission priority determines how Prevent Direct Access (PDA) Gold grants access to your private WordPress media files. Settings with higher priority will override those with lower one if both are set at the same time. By default, once a WordPress media file is protected by Prevent Direct Access Gold, it’s only accessible to admin users. You can change this default permission under its settings. Additionally, you can customize individual file access permission using Access Restriction extension. What’s more, you can even grant your private media files access to different membership types with Membership Integration extension. These default options will apply to all of your WordPress media files. For example, if you grant access to all logged-in users, they will be able to access all your protected files uploaded to your WordPress site. If you’re using any of our supported membership plugins, you will have an option to grant media files access to these custom membership types under Memberships tab. 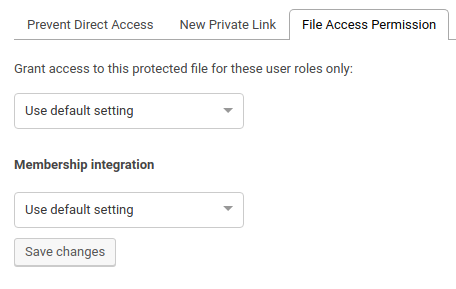 This is a global setting that will apply to all files by default and working together with (not in place of) the File Access Permission under Prevent Direct Access Settings tab. In other words, if you set “the file’s author” and “Members” under “General” and “Memberships” tab respectively, both the file’s author and Members users will be able to access your protected files. This option will get higher priority than the global settings above. That means no matter what roles and membership types you’ve granted access on Prevent Direct Access Gold settings page, if a custom permission or membership is selected on a particular file access permission, they will override the global settings. Since PDA Gold version 3.0.24.5, we allow you to set “Custom memberships” together with our default custom roles on each individual file. In other words, you can now set both admins and a custom membership to access a particular file at the same time. Individual file access permission will follow the global settings by default.